Take a look below and order some goat milk soap in your favorite fragrances! We now make sixty five (65) fragrances of goat milk soaps to choose from. 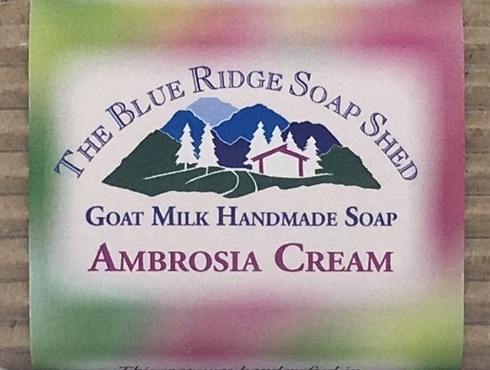 Our goat milk soap is listed in alphabetical order on the next several pages, or narrow your choices by selecting from fruit, floral, and spice groupings. People have been using goat milk for centuries to improve skin and enhance beauty. The ancient Egyptians considered a milk bath the ultimate in luxurious living, and Cleopatra bathed regularly in pure milk. Why? What is in Goat Milk that makes a Goat Milk Soap so different? Our handmade goat milk soap is made using fresh mountain goat milk purchased from local farmers. Regular use of our goat milk soap will maintain a moisture balance that results in smoother, softer skin that is less prone to roughness and the formation of lines and wrinkles. The alpha-hydroxy acids found naturally in goat milk have rejuvenating effects on the skins' cells, neutralizing free radicals and slowing the aging process. Who needs Botox treatments when you've got Soap Shed Goat Milk Soap? Why is Goat Milk Soap Brown? Thirteen (13) wrapped bars each enclosed in a colorful holiday cellophane bag tied with raffia, ready for gift giving! Almond Biscotti in a bar of soap, with a lighter almond scent than our Toasted Almond Cream. Ambrosia Soap is just like the fruit salad that makes everyone's mouth water, fragranced with orange, banana, pineapple and coconut. Our 'ABC' soap is simple mountain goodness with the tart scent of apple and the sweet scent of berries. Bayberry Soap is a traditional holiday favorite that reappears every Christmas just like good old Saint Nick himself. Bergamot Coriander is a great fresh scent combination for those who like clean, herbal fragrances. Our Black Raspberry & Vanilla actually contains Raspberry, Peach, Lemon & Strawberry along with flowers and musks. A rich, fruity blackberry scent deepened by brandy, in our goat milk base for great lather and moisture. If you're into brown sugar scrubs, then you've GOT to have this soap! Our Chai Tea Goat Milk Soap is perfect paired with a cup of the hot version while you relax in the tub! The delicate, soft scent of cherry blossoms on the Springtime breeze provide a sweet, floral delight for the senses in our moisturizing Goat Milk Soap recipe. Scented with luscious cherry and milk chocolate fragrances for zero-calorie, guilt free bathtime pleasure. Cinnamon goat milk soap, in a beautiful papricka color the soap creates naturally, all on its own. Our wonderful Citrus Medley Cream goat milk soap scented with three natural Essential Oils, Lime, Lemon & Blood Orange.